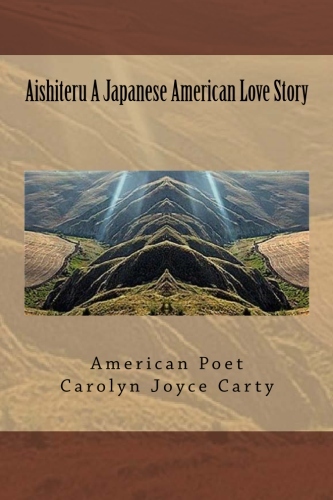 Aishiteru A Japanese American Love Story by American Poet Carolyn Joyce Carty poetry written by Carolyn inspired by Japanese Poet Shigeaki Miyazaki of Japan. The love poems are writtten in the Japanese & English Language. The love story; Carolyn writes her love poems her replies to Shigeaki's love songs & his poetic style. Shigeaki writes music lyrics, love songs and sings holding his audiences captivated worldwide. Carolyn's poetry is also known worldwide. Carolyn decided to expand her writings to include the Japanese language. She wrote the Japanese love poems for Shigeaki. The love story theme; two world renowned poets living a world apart with two hearts that become one. Carolyn inspired to finding love (something we are all looking for) and through her admiration for Miyazki then wrote the love poems for Shigeaki Miyazaki. The love poems titled; Aishiteru, Man & Woman, The Language of the Heart, The Footprints of My Heart, ID, Love Forever, Footprints, The Love Story of Many Dreams. Aishiteru Japanese American Love Story Love Poems Japanese Poet Shigeaki Miyazaki & American Poet Carolyn Joyce Carty. for each who shares a journey, our futures. for what am I if I am not human to all. believing it within the soul. Chage & Aska music videos, music entertainment, When will you believe, I want to build a garden upon the waters for us to walk upon...Chage & Aska music videos love songs the love song of many dreams Aishiteru, walk, say yes tomorrow man & woman the love story of many dreams. Ryo Aska (Shigeaki Miyazaki) Music Composer Music Artist King of JPop Composer of Popular Music Join Us in Our Poetic Promotions for Music Arts Worldwide. Chage & Aska music world news today music videos love songs the love story of many dreams walk aishiteru, say yes, tomorrow, man & woman music videos biographies & memoirs of the rich & famous Shigeaki Miyazaki & Carolyn Joyce Carty.